I want to preface this post with stating that this will be a more vulnerable and honest post than any of my other ones. This is more of a journal entry style post that I feel called to share this week. Truth being told, a big part of me didn’t want to post this, but I know that other women (pregnant or not) struggle with body image and that, ultimately, my own struggle with it is what led me to become a Health Coach in the first place. So because of that, I want to do better at being open and honest with you all about more personal areas of my life in hopes of encouraging you in your own journeys. There is no “black and white” or quick fixes when it comes to body image, diet and exercise – but I truly believe that how we respond to our internal conversations and thoughts can be so powerful and telling. So here we go…. Where to start, where to start….oh so many things running through my head these days. Sometimes I feel like a crazy person. My thoughts can go from the baby to Health Coaching to home repairs to errands that need to be run to work to friends to family to yard work to my next meal all in a matter of about 4 seconds. 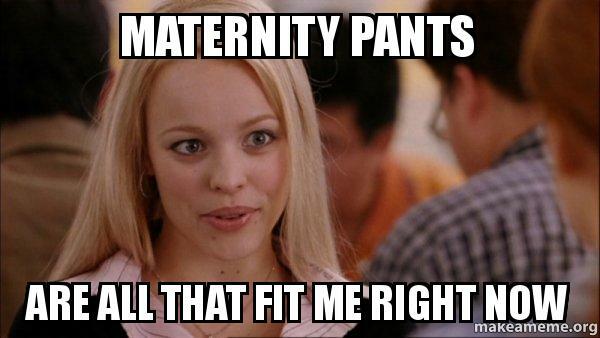 One thing for sure is that being pregnant is a total life perspective shift. As I looked back at pictures from the first month of pregnancy to the ones I just took this weekend, I can’t help but be astounded at the physical difference. It truly is amazing what the human body is capable of. But I would be lying if I didn’t admit that it also brought up some feelings of panic. For those of you that have been around here for awhile, you know that I have been on a journey to finding balance as it relates to diet and exercise in my life. I say ‘been on’ because while I am completely transformed from where I was, I believe you are never truly at a destination…each chapter in life brings new challenges and obstacles so it is a continuous process to figure out what balance looks like in each of those chapters. Looking back at pictures from month 1 of this pregnancy definitely stirs up those areas of me that struggle with body image and diet rules. I’ll admit that my first thought when I did the initial look back was “oh my gosh, I’ve gained so much weight – I’ll never be able to get back there. Definitely going to have to step up the diet and exercise post-delivery”. The even more shocking realization in this was the fact that when I took the “before” pictures, I wasn’t fully comfortable or happy in my body. In that current moment, I thought that I was getting “too fat” and struggling with the urge to want to go back to the ever dreaded diet cycle! Crazy, right? While I don’t struggle with this urge nearly as much as I once did, I’d be lying if I said the thought never crossed my mind anymore. 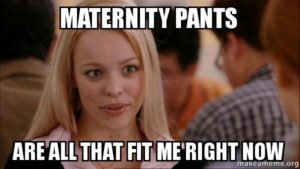 At my 36 week appointment I’ve only gained 24 pounds. For those of you who don’t know, the average healthy weight gain range for pregnancy is 25-35 pounds. So even if I were to gain another pound per week that would still only put me at 28 pounds total. While I dislike using the scale or a number for encouragement and no longer look to those for affirmation, it was this reminder that helped me snap myself out of my panic moment. At that point, I had two options: I could allow myself to go down the negative road of guilt, shame and lies and end up feeling down and out and horrible about myself or I could choose the positive road which would require grace, self-acceptance, reflection and would bring me back to reality. 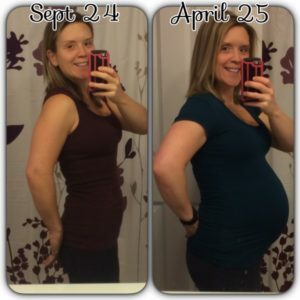 For so many years, I would have easily went with the negative road and would have used it to propel myself into comparison thoughts, lining up punishment at the gym and restriction in the kitchen for post-pregnancy. I won’t say that it was easy to not choose this road this time, but I will say that over the last 2.5 years of learning to trust my body, care for myself both physically AND emotionally and by lessons learned during my own bouts with the “diet cycle” early on in my journey, I know that that road will always lead me nowhere that I want to be and nowhere that feels good. I also know that all of these feelings and emotions stem from my ‘inner-critic’ and my over active human desire to control situations. My entire body image issues and messed up relationship with food and exercise relationship all stemmed from a desire to have control when things in life felt “out of control”. Pregnancy is definitely something that is out of your control. There is so much that can worry you and so much to think about that all you can really do is give it up to God and trust. Not so easy when you’re a type A personality 🙂 So it’s not a real shock to me that as the time approaches for things to be even more out of my control (delivery and figuring out how to raise a child), my desire to control would pop back up. This is a cycle for me. The difference now is that I KNOW what is happening and I KNOW I have the power and tools to overcome that desire and return to a place of calm. 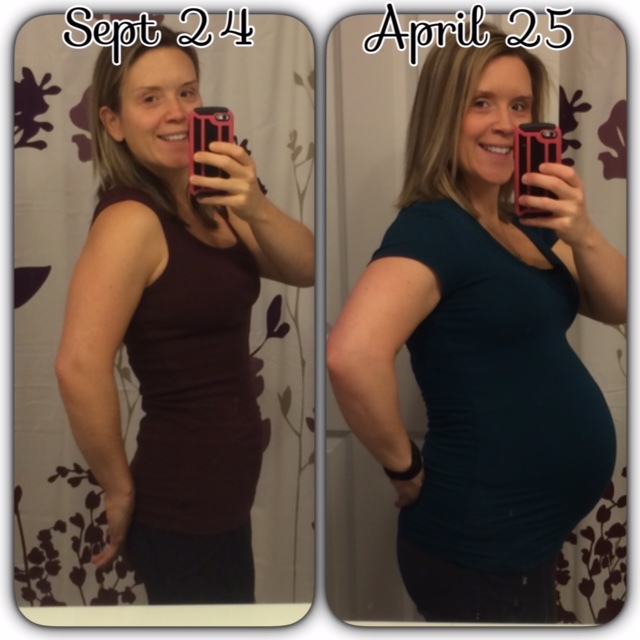 So there you have it, confessions of a Health Coach pregnant chick. 🙂 I’m not going to lie, it felt wonderful to write this post and strangely rejuvenating to let you guys read such a vulnerable post. Body image is a tricky thing…and so is finding balance with food and exercise. But I can tell you that being able to write this post knowing that I got myself out of that thought process feels nothing short of amazing! It’s this feeling that gets me SO excited about Health Coaching and about helping other women figure out their triggers and what tools they can put in place to reach that place of balance and peace. If this post resonated with you at all, please leave a comment or send me an email. I am making a waiting list for one-on-one Health Coaching after my pregnancy break and would love to get you on that list!